What surprised Paddington when he found his basket with wheels? Paddington's doorknob trick seemed to backfire when---. Paddington visited Oyster Travels one morning in hopes of---. Uncle Pastuzo treated treated Paddington and his friends to a---. 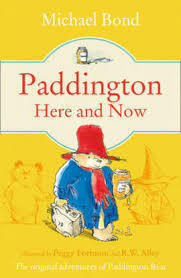 What was the one thing Uncle Pastuzo had taught Paddington? "Home is where you hang your hat"
"The most spectacular views of London are from your own home"
"Everything tastes better with chocolate"